Wow what a Summer! We have had the pleasure of working alongside so many wonderful customers including around 50 bride & grooms, our fantastic contractors at The Great Hall, Browsholme Hall, Staining Lodge and Fleetwood Town Football Club, Cuffe & Taylor and of course all the best industry professionals! As we emerge on the other side we wanted to update you on our previous 'operational' month around different Lancashire locations. August started with a bang as we catered in the VIP Marquee at Lytham Festival 2017 for the fifth year. This year we worked closely with the team at Cuffe & Taylor to bring a unique and prestigious experience to the VIP Marquee and our guests, bringing 'Twelve Restaurant to Lytham'. Head Chef Graham, alongside Chef Proprietor Paul created fantastic individual menu's over the five nights to fit in with the music of the evening! Team Twelve brief for the busy week ahead...Lytham Festival plus 3 weddings! The secret is in the planning! Sue is on the case! Getting into the spirit for 80's v 90's night! Happy Birthday Paul...we always have time to fit in a birthday serenade! It was a pleasure to cater for our 300 VIP'S per night in hospitality this year at Lytham Festival. Thanks for all the amazing feedback! We are now well into the season at FTFC and have received some great feeback from our different styles of dining in the Parkside Suite...we wanted to offer something different to the guests! Good luck to Fleetwood for the rest of the season. It's always nice to be greeted by Jimmy the cat for Fleetwood's home games! Jimmy the cat waiting for food! This summer has been one of the busiest and best wedding season's yet. We have worked alongside so many amazing bride and grooms and it has been a pleasure to be involved in every step of the process from the initial meeting and then the tasting to amendments along the way and finally to the wedding day itself! We have collated pictures from several weddings over the past month t really showcase the fantastic work of suppliers and wedding venues! Beautiful setting for Mr & Mrs Wignall! Refreshing selection of summer desserts! Lovely setting for the wedding of Mr & Mrs Sumner at The Great Hall. 25.8.17! Congratulations to the our industry friends, Dan & Tom who were married in a civil ceremony at Browsholme Hall. The couple opted for a more relaxed form of dining which has been incredibly popular this summer. The 'Italian sharing platter' included items such as dry cured ham and salami, course country pate terrine and tomato & basil brushetta. The Italian/ Mediterranean theme continued throughout the meal concluding with a cake stand of Italian desserts consisting of mini jarred tiramisu, lemon panna cotta and chocolate coated profiteroles to name just a few! It is always an honour to host special occasions in the restaurant whether it be a small birthday celebration to a large private hire wedding. This month has been no exception and we have been lucky enough to be a part of many people's special occasions! 20th August wedding of Mr & Mrs Riches! Congratulations to Mr & Mrs Marsh! A wedding is always a special occasion and we always aim to dleiver the best results for our bride and grooms and the wedding of Emma & Tom was no exception. We were so overhwlemed that Mr & Mrs Nelder asked us to be part of their magical day, especially because they initially met at Twelve! They have become dear friends of Twelve over the years, and it was a pleasure to see so many familiar faces who used to work for us.. including current head chef and best man, Graham! Mid Week Market Menu - Available Tuesday- Thursday from 6:30pm! Seasonal and fresh produce. 2 course £16.95 | 3 course £19.95. Friday 29th September- Entertainment Night with Ian Hooper! 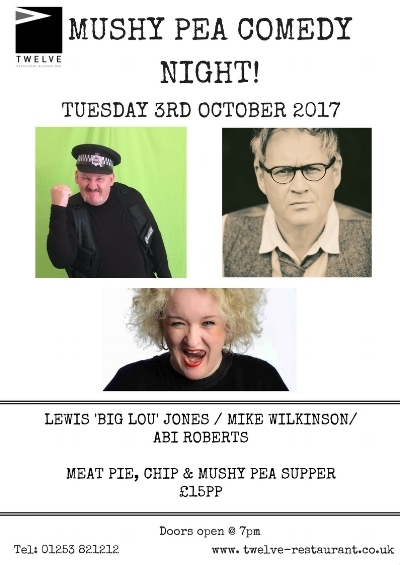 Tuesday 3rd October - Mushy Pea Comedy Night ! What an August! We have lots of exciting things to come over the next couple of months and will soon be releasing our Christmas Menus so keep your eyes peeled.